Method: Pour water and apple in a medium saucepan (ideally, enamel saucepan) and cook apple over low heat till tender. Drain, but keep the water. Pour the water back in the saucepan, mix in sugar, and let it till it thickens a little. Add the already tender apple slices in the water, along with lime juice and cinnamon. Cook for another 5-10 minutes and turn the heat off. 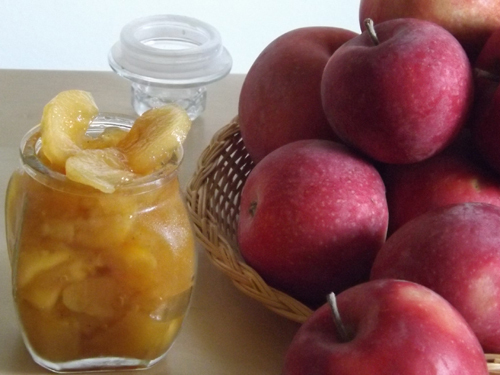 Let cool before pouring them in jar, and of course, keep in the fridge. Note: To prevent apple from going dark, peel them in a bowl full of white vinegar.